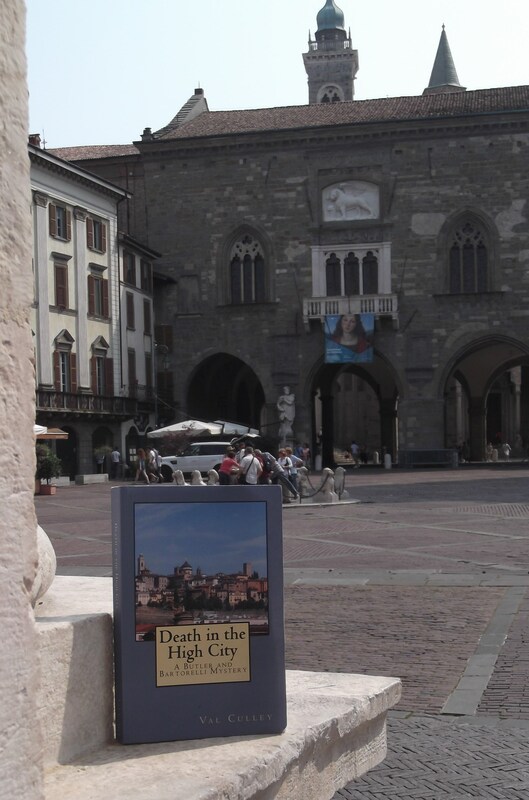 I have become a frequent visitor to Bergamo in northern Italy over the last few years and started travel writing as a result of my interest in the city. There are many ways in which Bergamo has inspired me as a writer, but probably its most fascinating feature is the way the Città Alta appears in the skyline enticing you to go up there. 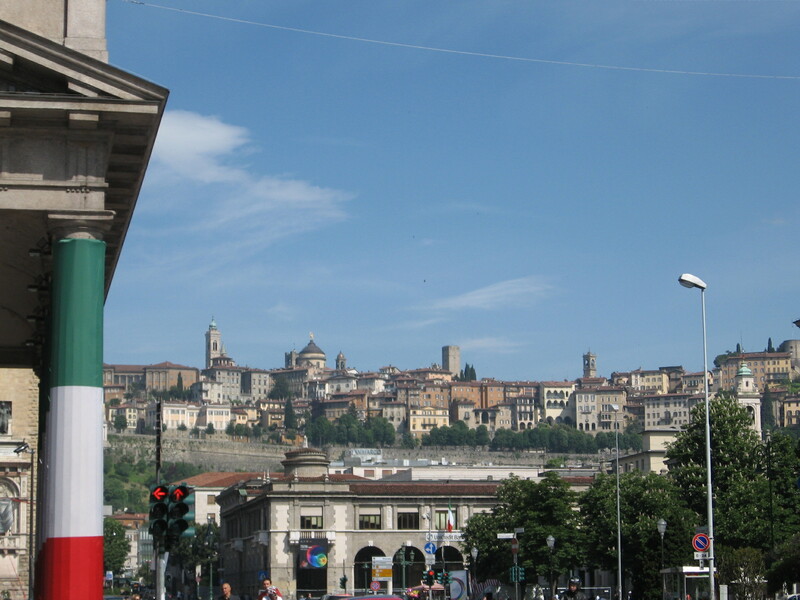 The view of Bergamo’s upper town in the skyline is one of the first things you notice when you arrive. Even as you get off the plane at Bergamo Caravaggio airport it is difficult to ignore the city. You can see the domes and towers of the upper town silhouetted against the sky from the airport runway. To move straight on to Milan, or one of the lakes, as many people do, without exploring the medieval Città Alta and the lower town, the Città Bassa, would be a great pity. If you arrive in Bergamo by train, or take the bus into the city from the airport, you will see a magnificent view of the Città Alta from outside the railway station. If you stand and look down the long, straight Viale Papa Giovanni XXIII you will see the towers and roofs of the Città Alta silhouetted against the blue sky, suspended as if by mysterious means. It’s a magical view and makes you want to go straight up there and explore the upper town at close quarters. The view is different according to the season. 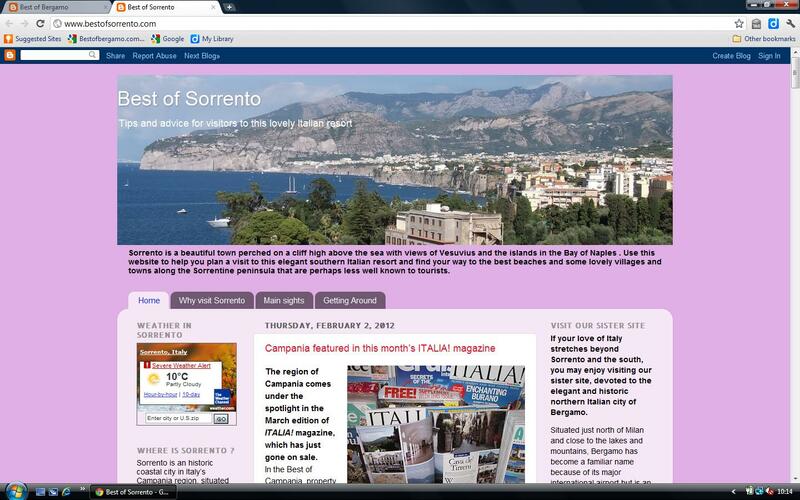 I have visited Bergamo in the spring, summer and autumn. The Città Alta looks magnificent on a bright day silhouetted against a blue sky. But it also looks beautiful shrouded in mist in the autumn. One of the most striking features that you notice straight away is the huge wall around the Città Alta. Le Mura is the name for the 16th century fortified walls that have divided Bergamo into two cities, the Città Alta (the upper town) and the Città Bassa (the lower town). They are truly monumental stone walls, completely surrounding the Città Alta, built by the Venetian occupiers and rulers of Bergamo in 1561 to keep invaders out. You will sometimes see articles written about Bergamo in magazines and newspapers, and information about the city in travel guides about northern Italy, where the Città Bassa is dismissed as not being worth a visit. But having stayed in Bergamo many times I have found that there are a lot of buildings of historical importance on both sides of the walls. Bergamo is an artistic and cultural treasure chest, but also has its own natural beauty, set among hills, mountains, lakes and rolling countryside. The Città Alta is an impressive fortified town, which has retained many of its 12th century buildings and has had some stunning Renaissance and Baroque architecture added over the centuries. It is where the Venetian east meets the Lombardian west. Because they governed for so long, the Venetians have left behind traces of their culture and style, such as the ornate fountains. One of the most historically important places in Bergamo is the spot where the patron saint, Sant’Alessandro, was decapitated by the Romans in 298 for refusing to renounce his Christian faith. Yet it is outside the walls in the Città Bassa. A Roman column in front of the church of Sant’Alessandro in Colonna is believed to mark the exact spot where he was martyred. Every year on 26 August Bergamo remembers Sant’Alessandro’s decapitation in 298. For the first time, in 2010, there was a re-enactment of the event in full costume at the scene as part of the annual Festa di Sant’Alessandro. The church of Sant’Alessandro in Colonna was rebuilt in the 18th century on the site of a much earlier church in Via Sant’Alessandro. Its ornate campanile was completed at the beginning of the 20th century. The church houses a work depicting the martyrdom of Sant’Alessandro by Enea Salmeggia and one showing the transporting of Sant’Alessandro’s corpse by Gian Paolo Cavagna. It also contains paintings by Renaissance artist Lorenzo Lotto, a Venetian who lived in Bergamo for 12 years. Via Sant’Alessandro is an ancient winding street that leads down from Porta San Giacomo into the modern centre of Bergamo. Yet the features and guide book entries that tell you there is nothing of interest in the Città Bassa completely overlook this area. (An extract from ‘Why Bergamo inspires me as a writer’, a talk given to the Nottingham Dante Alighieri Society in March 2012).